Listen, we get that the whole “Angel of Death” thing can sometimes get you down. You’re more than just your job! And sure, so you’re the last thing that people see before they’re forced to shove off this moral coil, and that’s a big responsibility! But we just want to make sure you’re taking some time for you, yeah? Like, do you have other hobbies? How about a favorite home team that you love rooting for? Us, we like Real Housewives - we just cannot get enough of people telling other people to be real. And yeah, it’s a guilty pleasure, but at the end of a long day at the office, it helps us unwind and find a little bit of diversion in our life. And it look like you could use a little bit of the same. We’re not saying that you look bad, but…you could maybe use a little freshening up! A new perspective! Maybe even Patti LaBelle it up with a new attitude! 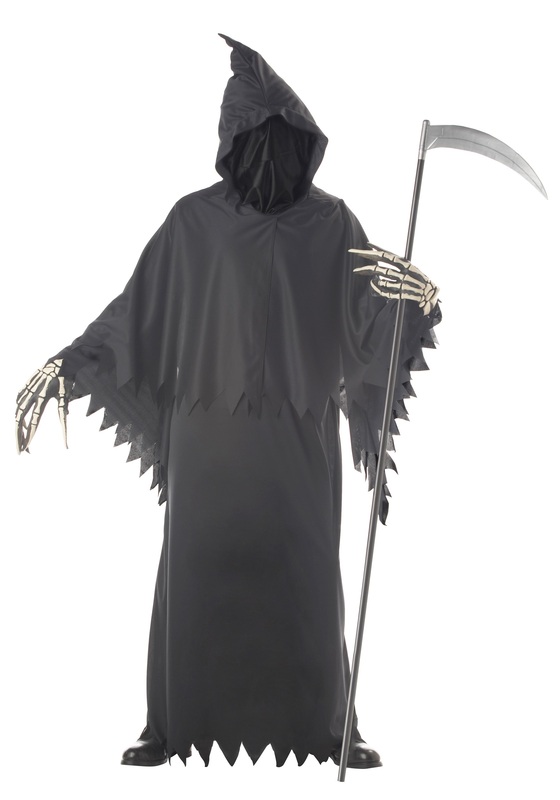 For instance, maybe try a brand new outfit…like this Grim Reaper Deluxe Costume! Made of 100% polyester, this costume features a long black robe with a black hood mask and attached cape. It even comes with scary vinyl skeleton hands for that “I just had these centuries-old paws done in a restorative lotion of death and despair!” Trust us - one turn around the graveyard in this Grim Reaper Deluxe Costume, and you’ll feel a young, fresh ghoul with a brand-new lease on death!